Since recently meeting and corresponding with Mike Campbell, both he and Bill Prymak have become institutions of analysis and logic … and truth-telling. As a long-time pilot with a habit of looking for the unseen insect on the leaf, I have lived by the principle of guarding against “overlooking the obvious.” I have even written about it. Since getting your book, I have been unable to put it down. I read a page, analyze it, take notes, read it again, and then start writing. But here, staring us in the face, is the obvious . . . which I missed. Something this obvious, and this powerful, is but another of the many data points of evidence which Mike has brought together in the finest, most professional collection of Earhart Truth ever assembled. And that’s not just my opinion. That’s the truth. How you have been able to put all these amazing pieces together is almost mind-numbing. It makes me angry that it has not been given more traction by the media. But, then again, how can a hyena change its nature? By nature, the media-hyena laughs at the truth. In all my years of study, training, researching, and achieving, the quality of the research you have done on the Amelia Story can be exceeded by no one. Thanks again for who you are … and what you’ve done. You have my everlasting gratitude, and admiration. — “Retired Captain Calvin Pitts, who in 1981 piloted the 50th Anniversary Commemorative Wiley Post Round-the-World Flight in a modified Single-Engine Beechcraft A36 Bonanza named the named the Spirit of Winnie Mae. In his long, distinguished career as a pilot and educator, Pitts also appeared around the nation representing NASA and its aviation research, and was awarded the Distinguished State Teaching Award in “Aviation and Aerospace Education” by Governor Ronald Reagan in 1970. Having arrived at this subject matter by way of a recommendation of DC Dave (David Martin), I was a newcomer to the writing of the author Mike Campbell. I believe that Mr. Campbell is one of the most talented and passionate authors of non-fiction I’ve ever encountered. He really cares a great deal about presenting all of the various points of view, arguments and opinions of the numerous researchers and authors who have attempted to solve this mystery over the past decades. I find this book as the major authoritative compilation or encyclopedia of all previous works on the subject of Amelia Earhart & Fred Noonan. Mr. Campbell is concerned with one primary element, and that is providing the reader with the straight truth. No sugar coating of anything or anyone in this book. There is a tremendous number of persons, dates, locations, and historical facts to keep track of, but throughout this work Mr. Campbell presents the unvarnished truth concerning all. You will have no doubt about what really happened when you finish reading this book. — Amazon.com review by Michael A Hawkins, April 24, 2018. This reviewer has covered most of the voluminous output on America’s greatest heroine, but nothing comes close to this, the most exciting and scholarly read since the late Thomas E. Devine’s compelling Eyewitness: The Amelia Earhart Incident. Clearly, Mike Campbell is the leading authority on all things AE, and this book must now be considered the recognised masterclass and essential go to handbook on what really happened to Earhart and Noonan. The author’s brilliant grasp of his subject is truly astonishing, and the sheer depth of his research is a marathon achievement. … The truth is there to be had — right here, right now – in the revealing pages of Mike Campbell’s incredible book. — Roger Hopkins, United Kingdom, Amazon.co.uk reviewer, Feb. 10, 2015. No one has ever written more comprehensively on the subject of Amelia Earhart’s disappearance than Mike Campbell, and no one is more trustworthy on the subject. That last point is not a small one, because the Earhart mystery continues to be a hot topic, and there are still an ample number of shills for the government who would lead one astray. 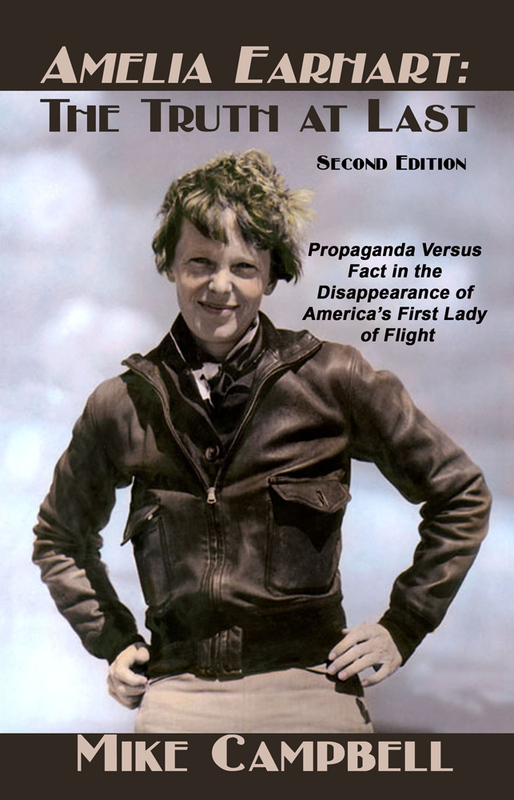 The very best evidence that Campbell is the man to be trusted on this subject is the fact that, as of the date of the writng of this review, both this book and the earlier book that Campbell wrote with Thomas E. Devine are blacked out at the very large Amelia Earhart Wikipedia page. Mechanicsburg, PA — Mike Campbell’s thoroughly researched solution to the Amelia Earhart mystery, Amelia Earhart: The Truth at Last, was the top selling book for Sunbury Press in 2013, taking Sunny awards for overall sales and for the nonfiction category. There have been many books written about the mysterious disappearance of famed flier Amelia Earhart in the 75 years since she vanished on a world-record trans-Pacific flight. We can absolutely say, without equivocation, TRUTH AT LAST by former Air Force civilian public affairs officer Mike Campbell is the best by far. We don’t want to spoil it for our readers, but by the time you finish this masterful work, you will agree. Campbell has solved the mystery of Earhart’s tragic fate. The disinformation attempts and crackpot theories of those approved of by the government don’t even come close to TRUTH AT LAST. A copy of this book belongs in every military post and civilian library in America. You can make that happen, dear readers. Just go to your librarian and ask for it. Tell you local bookshop to stock it, and pass the word on to friends. Let’s make this one a best-seller! I received [Amelia Earhart: The Truth at Last] yesterday and it is superb. One of the most interesting aspects of it is the additional, previously unpublished info Mike provides on various previously published accounts, especially on Fred Goerner’s investigation. It is clear that Fred learned far more than he published. The book also reinforces my own [long]-held belief that AE ended up on Saipan, indeed makes it seem incontrovertible. Moreover, Mike’s book seems to be the most significant one published on the subject in an extremely long time. I am currently feasting on it in every spare moment. — Dave Bowman, author of Legerdemain: Deceit, Subterfuge, and Political Sleight of Hand in the Disappearance of Amelia Earhart (Saga Books, 2007). Everybody must get a copy of Mike Campbell’s just arrived book AMELIA EARHART: THE TRUTH AT LAST. It’s a fascinating, scholarly book digging like no researcher has even done before, over 100 credible witnesses strongly supporting the Saipan-Mili answer to the mystery. Mike has included some research I have never released before. A must read for AE aficionados. — Bill Prymak, founder and former president of the Amelia Earhart Society of Researchers, Broomfield, Colo. I waited a long time for this book to come out, and it was well worth the wait! If one is a serious student of the Earhart matter, you must have this book in your library. When I opened the package, I said, “Wow!” This is a thick book!” Its 460 pages long, and is packed with interesting information that will wet anyones appetite. Inside you will find an interesting narrative of the Earhart disapearance, step by step as it goes along. This is no cursory look at the events, but an exhastive treatment of what really happened to Amelia Earhart and Fred Noonan. This book should be a “must read” book at all high school American History classes. This is an alternative view about what happened to our flyers, but I believe is is the correct view. Mike Campbell has searched far and wide to develop this analyses, and has done Earhart fans a great service, by digging deeply into the Freg Goerner files at the Nimitz Museum in Texas. There are many new developments given that probably would have been in Fred Goerner’s new book, had he lived to publish it. The Saipan Scenario is more than a scenario. This book will show you that it’s a fact that Earhart and Noonan met their demise at the hands of the Japanese, on Saipan. Mike Campbell backs this up with many, many, eyewitness accounts in both the Marshall Islands, and on Saipan. Its time the truth be let out about what ACTUALLY happened to our two flyers, and this book does the best job of it. — Rob Ellos, Earhart performance artist and researcher, Stillwater, Minn., Amazon.com review, Aug. 19, 2012. The first thing that one discovers when looking into the contrary eyewitness evidence related to the Earhart disappearance is that Campbell sits at the peak of a rather impressive pyramid of citizen evidence gatherers on the subject. Beneath him on the pyramid, among others, are a number of veterans of the U.S. military. Preeminent among them was the late Thomas E. Devine, author of the 1987 book, Eyewitness: The Amelia Earhart Incident. Devine, a twenty-eight-year-old Army sergeant at the time, was among the troops who captured Saipan from the Japanese in July of 1944. While on Saipan he had a life-changing experience. He saw what he is certain was Amelia Earhart’s Lockheed Electra. He wrote down the “NR 16020” written on the plane and remembers wondering what the “NR” meant. He also witnessed the burning of the airplane upon the orders of American government officials in civilian clothes.
. . . Don’t expect any of our mainstream press to be directing you to Campbell’s book, though. If he is to be ignored, it will not be because the case he makes for the capture of Earhart and Noonan by the Japanese is too weak. It will be because it is too strong. — From David Martin’s “Hillary Clinton and the Amelia Earhart Cover-up,” Veterans News Now, Aug. 9, 2012. This book kept me transfixed! The documentation was so thorough and complete, listing every single theory and viewpoint ever voiced in regards to AE’s fateful last flight. He does not express his own opinion, but as any genuine researcher who wants to know the truth, he explores every witness testimony, every fact and every trace of thought to allow the reader to see the truth for themselves. The conclusions drawn from such extensive research lead one to see what truly makes the most sense for the time period. It is an amazing book and one I highly recommend. Please know though that this book is so full with each and every detail that you must be ready to focus on the extensive disclosure of names, dates and military data. Not wanting to leave one detail out he has been thorough but that much detail can be challenging to comprehend and facilitate in your mind. So be ready to pack your brain full! Worth every jot and tittle!! — Nancy Jackson, Amazon.com review, June 16, 2014. I also hope this will happen. Knowledge about Earhart’s life and death should be based upon “the truth, the whole truth, and nothing but the truth.” — Joel Freedman, “Truth at Last” shatters Earhart myths,” August 16, 2012, Books Section of the Finger Lakes Times, Canandaigua, New York. I just wanted to drop you a quick note to thank you for writing The Truth at Last. I just finished a marathon reading of it over the weekend. It is an extremely good read, and a very well documented and referenced work….most impressive. I am an engineer – I investigate problems in structures for a living, and have for over 40 years. The level of detail you put into this work product is most impressive, and most convincing. Ms. Earhart and Mr. Noonan deserve to have the real story recognized and acknowledged by the whole world. Perhaps someday that will happen. Thanks again, and congratulations on a tremendous book. What is the source of your quote from General Erskine? And to whom, by name, did he state it to? It would seem this statement would have ignited a firestorm, yet it appears not to have done so. The source is Fred Goerner’s letter to Theodore Barreaus, February 19, 1988, from the Goerner Collection at the Nimitz Museum in Fredericksburg, Texas. See page 365 in Truth at Last. Apparently Erskine did not tell Goerner what he told Jules Dundes and Dave McElhatton at the KCBS studio, and it was only later that they told Goerner. That’s the best I can do with the information I have. The general knew that the truth about what happened to Amelia was still top-secret and he wasn’t about to risk government reprisal by announcing it on the air with Goerner, but, like Nimitz and Vandegrift, he admired Goerner’s persistence and wanted to encourage him to continue his efforts. Thus his revelations to Goerner’s KCBS associates. You wonder why no “firestorm” results from Erskine’s comments? Well, few ever learned about them. But why was there no firestorm when the July 1, 1960 edition of the San Mateo Times announced in 100-point headlines: “Amelia Earhart Mystery Is Solved”; “Famed Aviatrix Died on Saipan”? For these and other answers, I suggest you invest in a copy of Truth at Last, if you haven’t already. Thanks for your interest. Mr. Campbell, I am searching for your email address in order to send you a pdf file of the November 6, 2014 letters to the editor page of the Philadelphia Inquirer, where I attack the “absurd, self-aggrandizing claims” and questionable “fund-raising activities” of Ric Gillespie. The Inquirer printed an Earhart photo with it. Ric Gillespie is making a fool out of himself. Just clicked on this for fun and because I have been to Saipan and walked in the Japanese prison that had the remains of the cell Amelia Earhart was supposed to have been kept in. I am not an expert on the history of Amelia Earhart, but what most people don’t know is that the entire Island is considered a monument to those who died during WWII. I was introduced to a man whose job had been diving off shore and defusing or bringing up live bombs for safe removal. He described the mines that were anchored and floating beneath the surface that endangered any boat or ship that might have run across them decades later. The ocean around Saipan was littered with live bombs for many years. I was there in about 1973. When you walk through the jungles you are literally treading on history. Nothing is allowed to be removed from it’s spot where it landed during the war. You walk past U.S helmets, and pieces of planes, rotting military objects like canteens in shredded canvas, parts of equipment every soldier would have carried in the exact position they had crashed in or died on so long ago. There were so many different objects. It felt as if I was walking in a cemetery with those items as the monuments to those to whom the items had belonged. The people of Saipan at least at that time treated it as holy ground . They respected it as the place of death for many, many, souls. I know Americans are quite used to making money from tourist traps, and Saipan certainly uses their history to draw in money, and it is a fantastic resort area. But at least back when I was there they were not jaded enough to tell tall tales about Amelia Earhart. They would have considered it a curse upon them to do so. They did not take lightly the sacrifices of those who died there. Far too many people were still alive who had seen all that was done there during the war. They honored the dead and they said Amelia was among them, alive for a while. There was little food given to prisoners, and just damp open barred windows, no glass. It was a small building with just a few cells. I will always consider it a holy place and I am grateful for the people of Saipan still honoring our dead. He allowed Pearl Harbor to happen in order to garner national support for the entry into war with Japan. Americans wanted no part of war so Pearl Harbor proved to be a pretty strategic way to rally the nation together. The book” DAY OF DECEIT( OR DAY OF DECEPTION) ” covers this in detail. With that being said, I have to wonder about the YOUTUBE VIDEO about the teen girl( at the time of 1937) who supposedly caught 2 hours of radio communication from Earhart’s plane after it was on land. What teenager would make such a thing up? Sitting by her radio listening to top songs of the era in order to write their titles and lyrics down, only to get this bizarre transmission coming through her radio. She was given some kind of an award about 2 yrs ago- I think she is in her 90’s& may still be alive. But what is odd, is that while she was in St. Petersburg Fla hearing the transmission through her radio- many others in the USA- across the nation in varied states,also claimed to pick up Earhart’s radio transmission of asking for help. Amateur radio operators. Or in the case of the girl- a fluke signal coming through her home radio? Are these tales legit? And if that many amateurs heard her- what about anyone who professionally worked with radios and also got the SOS transmissions? Some authority debunked this idea that regular people across the USA could pick up her signal due to AE’s distance. He said the signal would never carry that far. But then it was explained that harmonics is what allowed the signal to travel even further than normal. I am gathering from description given, that harmonics acts sort of like an echoing of a radio signal- thus letting it radiate further than the general range? Do we give credence to any of this? Or, possibly, the truth is, a great effort was not actually expended to save her-which also makes him look bad. Especially, if she was requested to fly as a unofficial, but” official”, spy detail. The govt/military seems to find those who fight their wars and such, as quite disposable. AE would fall into that category like any other soldier of war. I could see the govt/military decide that finding her would be too costly and not worth the effort. Why else are all the records missing? If she was simply a pilot with a mishap that was murdered by the Japanese, should this have not come out to the public now? In his quest to get an isolationist nation into war- FDR could have usefully trotted out the death of AE by the Japanese, as a earthshaking revelation. He could have stated that the info was originally with held from the American Public because of its gruesome nature; but once Pearl Harbor was attacked, the govt finally realized the nation must know what Japan did to their beloved AE. Especially when FDR seized on the Pearl Harbor bombing as a way to declare war. What we always have to remember, world leaders, including US presidents are not saintly Godly individuals, but brutal driven manipulative people, there are NO Mother Teresa s as heads of countries. If they were truly Godly they would never have gotten to be leaders but would have been trampled on by other driven vicious politicians. It makes me laugh when people criticize Trump. He is the only leader that is honest about his true nature. And the media can’t stand it. They are familiar with deceptive people that act saintly but have souls rotted putrid on the inside. FDR did a lot of good to help people during the great depression, but clearly Earhart had a flight plan that took her through dangerous territory for some reason, she could have taken countless other known routes to achieve her round the world stunt as Howard Hughes did after her in 1938. You did’t see Hughes flying through Suspected Japanese islands. He took the northern route, even Russia. Imagine Communist Russia was safer than Marshall Islands. Just a note about receiving weak, far away signals. As a Radio Ham and also holder of an FCC 1st license I believe it was very possible. A condition called skip happens when radio waves are bent or reflected by ionized layers of air and follow a different path. Some time they bounce from the surface of the earth, especially from salt water and repeat the process. Skip is more prevalent during sunspot activity which varies over an 11 year cycle. 1937 was at the peak of the cycle! What can I say, other than I understand the depth of your frustration over this story. How so much evidence can be ignored, is beyond me. I still find it incredible that not one established, credible journalist in some form of media has not dug into this story and presented the real facts. Where are the Woodwards and Bernsteins in today’s media? Every time I read your blog, I wish I were a wealthy man so that I could fund a one hour documentary(running on a major network), that would have you collating all this evidence and presenting the truth to the public. I think the uproar and outrage would finally force the media and our government to come clean. Naive, maybe, nice to think about. Thanks, again. I am 100% in agreement as to the most likely outcome of Amelia Earhart and Fred Noonan. It certainly wouldn’t be the first or last time that governments in power have lied and/or covered up their actions; supposedly in the name of public protection. I have not yet purchased your book but did read Lost Star by Randall Brink, published in 1994, in which he covers all the various scenarios. The most interesting facet of this book were several photos. One shows Amelia being sworn in by an unnamed officer of the Army Air Force while Major General Westover (commander of the USAAF at that time) looks on. The other pic was taken of Taroa Island in 1944 by a surveillance plane and clearly shows the outline of a twin-tailed monoplane missing its left wing sitting on a revetment. As the author states, Japan did not build any twin-tailed monoplanes. In spite of the frustrations and obstacles that you have encountered, it is much appreciated by individuals such as myself who do not have the ability to do such in-depth searching to find the truth. Thanks so much for your kind message. The photo of the alleged Electra in Brink’s book was later revealed to be a Jap Betty Bomber, Amelia’s alleged “swearing in” by Westover was ceremonial only and had no bearing on her actual civilian status, and many other claims by Brink have been exposed as false. Do yourself a favor and get Truth at Last, Jerry, and you won’t find any false claims for sensation value. The Truth itself is quite sensational enough. If you don’t find Truth at Last to be far better than Brink’s book, I will personally refund your money! Hi, just found an interview on you tube which you did a few months ago, regarding your new book The Truth at Last. As a pilot and someone that has followed the Amelia Earhart story for some time, i was very interested in your lifes work and all of the information you have collected. As I’m not a US resident and Earhart is not one of our historical heroines, it is sometimes difficult to follow the story. I found your interview by Shere accident after reading a post on twitter by fake tighar. Needless to say, I will be buying your book, and i’m sure i can spread the word via social media on this side of the pond. Kind regards, and i will be following your story. Very best of luck Robin. What part of the world are you in Robin? I too am not a US resident, however being from New Zealand and on the door step to the Pacific it has always held interest to me and I find 1st and 2nd Edition of Mikes book to be a game changer of information and credible sources to what happened. All of my family have read the books – and even the most sceptical has to concede defeat that there’s been more to the story than the “the flyers got lost and went down” theory/sweep under the rug. Thanks again Mike for all your hard work – as a fan in his 20’s this story will be put in every library I can find and for years to come be kept alive. AE deserves to be better remembered and recognised! Thanks NZFly, you and Robin are rare birds. In the states, selling a single book is becoming even more difficult each day. It’s quite discouraging, but nobody said it would be easy. I stumbled onto this subject by accident, but found it fascinating to say the least. My question would be why is this such a taboo subject even now?? Why the cover up so many years later? This was pre world war 2 after all. I believe the evidence you laid out and it ties a lot of loose ends together on this story. Thank you for all your hard work in finally answering what happened here. The photo shows a Japanese ship, Koshu, towing a barge with something that appears to be 38-feet-long — the same length as Earhart’s plane. For decades, locals have claimed they saw Earhart’s plane crash before she and Noonan were taken away. Native schoolkids insisted they saw Earhart in captivity. The story was even documented in postage stamps issued in the 1980s. “We believe that the Koshu took her to Saipan [in the Mariana Islands], and that she died there under the custody of the Japanese,” said Gary Tarpinian, the executive producer of the History special. Here it is, July 6, 2017 and the news in the national and international press is gushing over a newly (or not so) released photograph depicting the potential for granting wishes. Along with a two hour television special on History this coming Sunday in the US, this may indeed ignite the fuel long deemed buried regarding this matter. Should this come to pass, as it may since so many folks learn history from television, the many maligned and hidden facts from the past may once again come alive, and with a roar. For those that have poured their lives into this… your moment may be near. Here’s to all of the fine work that has preceded this, and I thank you. Great book, could not put it down. The details are amazing. Many of the thing you said are being verified by latest revelations, like Most recent History channel special. I understand you don’t especially like the photo? The photo seems to show somewhat what was in the Marshall island stamps of 1987. Thanks for writing this book. Just finished the 2nd edition. This is the best book I’ve read thus far on AE. I have read Last Flight, and Lost Star by Brinks. What is your recommendation for my next read? After the ground loop at Luke field, we know that AE commented that she had “mortaged the future” in order to forge on. This would seem to indicate that repairs to the plane would be an enormous cost. It would follow that if she was offered financial assistance from the US goverment, she could continue her “Last Flight” of her career. Could she have been offered that help on the condition of her helping to obtain vital intel for the military? In Lost Star, there appears to be a photo of her taking a military oath in a flight suit. It alleges she had accepted a field commission and given the rank of Major. Technically, this would now put her on the payroll of the US government. It is also noted in the photo that this is not a military issue flight suit. It is a “military styled” flight suit. AE was known to have her own fashion line and interest in clothes design. She is wearing standard military type pumps, but the flight suit is taylored, her helmet and matching belt are definitely not mil-spec. It appears as though she had embraced the idea of military service, and put her own style into the flight suit design used in the photo. Perhaps she was briefed on the certainty of immenent war with Japan, the difficulty that the government had in obtaining intel in the Japan Mandates, and appealed to her WWI experience as a nurse caring for crippled aviators in Toronto hospital. And that she could play a vital role in preventing needless casualties due to lack of intel by serving her country while on her self described final record flight ATW. This would have ratcheted the stakes of this ATW flight up beyond heroism. If successful, it would be a crowning achievement: former pacifist, famed aviatrix, becomes legendary US war hero. It would go far beyond just publicity to sell a series of expository adventure books, it would serve to strengthen the morale and resolve of hundreds of thousands of troops and sailors and Marines that would later fight the ensuing war with Japan. That photo, found in Honolulu, today is obscure. However, had she been successful, that photo would surely have been turned into a ubiquitous recruiting poster for WACS, which was probably the original intent when it was taken. Charles Lindbergh, initially an isolationist, travelled to Germany prior to the outbreak of WWII, to accept an invitation to inspect Goering’s Luftwaffe. He even accepted a Luftwaffe military medal while there. He later reversed his point of view once war brokeout, and, despite being rejected for military service, he appealed to Lockheed to allow him to serve the war effort as a civillian, working closely with Lockheed engineers to improve among other things, the performance of the P-38 Lightning twin engined fighter plane.The P-38 once it was deployed in the Pacific Theater, was reportedly having problems living up to its promise as a Zero killer. Lindbergh, through extensive flight testing of the P-38, had ascertained that the problem lay with superchargers performance at certain altitudes causing excessive fuel consumption, and losing range, and high altitude advantage. Rather than take the plane out of service for remedial repairs, Lindbergh worked feverishly to re-configure the manufacturer flight regimes, and strongly recommend new specific flight tactics to be used with the P-38. He was so fervent in his newly discovered patriotism, he was allowed to covertly join various squadrons operating the P-38 in the Pacific as a civillian consultant. Air Commanders were so impressed with the improvements in the airplanes capability, they eventually acquiesced to Lindbergh’s pleas to allow him to get in the fight. As a civillian instructor, he was specially authorized to engage the Zero in combat, eventually downing 5 or 6 enemy aircraft, qualifying him as an Ace. Clarence “Kelly” Johnson, who did much of the aerodynamic design work on the L-10, in later years became the Chief at Lockeed, and is renown as the principal designer of many spy planes produced at Lockheed Burbank factory, later known as the Skunk Works. Among them the R-5, U-2, SR-71, TR-3B, TR-4. Could AE’s L-10E have been converted, after the ground loop, to be the first Lockheed clandestine photo recon plane? Brink, in Lost Star alleges that a Fairchild Aerial Surveillance Camera was installed in the belly of the Electra. This very sophisticated camera system was already in widespead use in the US military, especially in the Navy. Along with its gimbal mount, power supply, remote control, and automatic controls, film cassettes, the whole installation could weigh two or three hundred pounds or more. This would have been installed directly aft, or adjacent to Noonan’s work station. This would mean two or three hundred pounds less fuel capacity aboard. The camera requires that a constant pre-determined altitude to be maintained while in operation. With all subsequent spy planes, the objective had been maximum speed, maximum altitude, maximum endurance and loiter capability. With all the fuel that would be required for a mission over Truk, perhaps it was determined that it would be better to use a more powerful Electra variant, one that for the casual observer and most press, would be indistinguishable from AE’s Electra. Could the Electras have been switched somewhere along the route or even from the beginning at Burbank? On her departure it was uncharacteristic of her to leave so hastily, without all the publicity, which up until then had been her bread basket. Publicity is what fueled the whole enterprise. Now she had less of a need for publicity it seems, and would also serve to get underway quickly before anybody noticed anything different about the Electra, especially the 16 to 18 inch camera porthole in the belly of the fuselage. Leaning to the idea that AE never intended to land at Howland, and that any radio traffic to or from Itasca was part of a rouse to confuse Japanese intel about her actual whereabouts. Perhaps she was communicating or daftly utilizing the new DF on another undisclosed secret frequency, or homing on some other station, perhaps Jaluit? While busy working with Noonan, AE perhaps had her hands full operating radios and DF and camera whilst piloting the plane through weather. She had the auto pilot, but it was having problems, and it was probably quite primitive by today’s autopilots, allowing only wing leveling and pitch, but not heading. The very short transmissions received by Itasca were not necessary for the real navigation objective, only to serve to confuse listeners on that well publicized frequency set. Noonan would be busy changing film cassettes, operating the camera, looking through the viewfinder, as well as navigating. Easterly winds aloft, plus a propensity to drift left, may have put her in a critical fuel state, to the extent that she was not quite sure exactly how much fuel she had left on board, based upon fuel consumption regimes and calculations. The gas gauges and fuel analyzer gauges were giving some trouble earlier, increasing the likelihood of uncertainty. Perhaps also, a new, switched Electra may have exhibited unfamiliar flight idiosyncracies of it’s own. In the exhibited transcript of a phone call between FDR chief of staff and Mrs. Roosevelt’s secretary, requesting a full report of the last moments of AE’s disappearance, the chief was quoted as saying that AE “disobeyed all orders”, etc. It would seem unusual for a civillian to be issued orders. A person in the employ of the government would be obligated to obey orders, especially military orders. Due to lack of proper military training and indoctrination, a newly field commissioned Major in the USAAC, may have, under tremendous pressure, quite possibly being fired upon and attacked by an unknown number of Japanese aircraft of the Akagi, may have departed from following the “orders” in order to evade capture of personnel and aircraft. Perhaps the orders were to maintain radio silence if shot down, or to scuttle the airplane, or who knows? I do understand your aversion to the use of the term “spy” as in connection with Amelia. At that time, the word may have evoked a negative connotation, and I would never want to suggest anything negative about this American Hero. Aerial Reconnaissance was brand new prior to the Second World War, and the whole science thereof was nursed along by small committed cadre of US Naval and Marine Aviators on a shoestring budget. Until the war broke out, little attention was paid to Aerial Photo Recon aside from map making. But in the thick of it, Allied forces soon discovered the ultimate value of Air Recon Intel: To spare unneccessary loss of life and limb to Allied personnel, due to not knowing what they are up against. IF this is what happened, like Lindbergh, the light went on in her heart– Earhart’s. Thanks again for writing such an excellent book, hope to hear your comments! Thanks for your kind message, glad you like TAL. I would recommend Goerner, Loomis and Devine’s books if you want to round out your Earhart reading. No others are necessary or present any important information relevant to the disappearance. Amelia was never a member of any U.S. military service. I’m not going to go looking for all the details right now, but the photo in Brink’s book depicts some kind of ceremony that did not involve Amelia actually becoming a member of the U.S. armed forces, but an “honorary member” without any official ties. Brink’s book is full of errors, half-truths and outright lies, and has done little to advance the truth while causing plenty of confusion. An example is your impression that special cameras were mounted in the Electra, an idea you found in Brink’s book. Bill Prymak looked deeply into this claim and found no evidence that any special cameras were ever mounted in the Electra. Amelia did have a little Kodak hand-held that she could have used to take shots of Truk as they passed over on July 2, if that indeed was what happened. It’s quite possible, but we don’t know for sure. While no evidence exists that the U.S. government paid for the repairs of the Electra after the Luke Field crash, there is hard evidence that Putnam paid for the repair himself. I don’t have it front of me, but will keep it in mind and add it here if and when I find it.